One of the nicer things to happen this week is that Maura Johnston’s radio show for Boston College’s WZBC came back on the air. Maura is an old and dear friend who most of you probably know anyway – her name is likely to crop up in these emails a lot, as she’s one of the people whose music recommendations I take most seriously. She also has a wonderful voice for radio – warm and enthusiastic in a way that can’t help remind me of Peel, or at least of the experience of listening to Peel on a Winter night and hearing music from far away well up from the silence between tracks. One of the tracks I particularly liked was by Madeline Kenney, who I’d never heard of but whose deceptively gentle indiepop felt immediately cosy without feeling bland or unimaginative. Her music reminded me of how The Sundays developed as they moved away from jangle-pop into looser, more shoe-gazey structures: fuzz as a doorway to the interior, a sound-pool of introspective longing. The track Maura picked, “Cut Me Off”, approaches the condition of pop; other songs drift along with only a friendly nod in that direction, but that’s enough. Not knowing anything about techno and house producers used to be part of their deal – ‘facelessness’ as a thrilling challenge to the pitfalls of rock biography. Googling Shinichi Atobe brings up lots of phrases like “deep house enigma”, which honestly only means I know as much about him as I do about anyone who makes deep house. Last year’s Heat is a double LP, four instalments of the title track, two of another, and dropped in the middle a two minute bubble of piano called “Bonus”. The “Heat” tracks feel like a long drink, an antidote to their title, cute melodic burbles over persistent but not insistent rhythms. It came out unexpectedly at the end of last summer’s hot spell, and would have fitted very well with the warm nights. Here we are in midwinter, though, and this year’s early releases are starting to poke themselves into my awareness. I heard about Maggie Rogers’ LP when somebody mentioned the (negative) Pitchfork review in a way that made the LP sound intriguing, or at least not a complete mistake. I happen to agree with Pitchfork that it doesn’t work, for different reasons – they point to the production flattening Rogers’ voice, I think she pushes too much and too harshly against it. 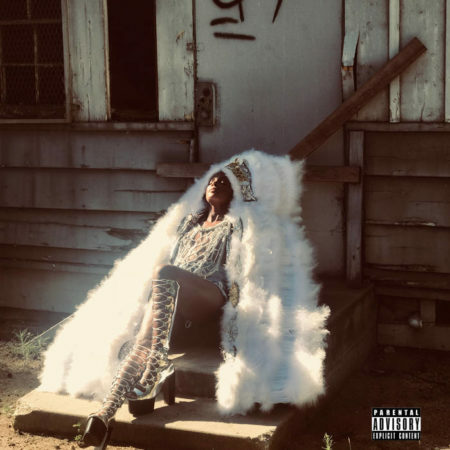 Dawn Richard’s new breed is much better, her best maybe. I admit I’ve been disappointed in myself for how little I’ve been tempted back to some of her earlier LPs, which gave the impression of a long-dammed imagination in flood; awesome, but also something I instinctively wanted to get out the way of. From drier land I watched a lot of others soak themselves and come up grinning. New breed is calmer, shorter, more focused, but still complex and rich and interconnected. The closing payoffs of “vultures wolves” and “diamonds, we” hit especially hard: confident reminders of how steadily and hard Richard has had to push to get to this level of recognition. Dawn Richard’s trajectory is determined; James Ferraro’s maybe more predictable. I hadn’t checked in on him since the buzz around his 2011 record, Far Side Virtual, a record which I liked without trusting. Later I learned there was a name for that genre, and it all felt that way – vaporwave, which came to mind this week when I watched a remarkable 3-minute video of Jean-Michel Jarre explaining how he’d come up with HSBC’s “sonic brand”. Jarre talks through the process with the kind of self-seriousness that gets boardroom tails wagging. It’s not like the suits don’t think there’s something stupid about coming up with a “company sound”, and you have to play it absolutely straight until the money’s in the bank. This is not a review of the HSBC sound. But it made me think, what’s James Ferraro up to? What he’s doing is making attractive music with a high, but slightly banal, concept – long, organic folksy pieces interrupted and distracted by the sound detritus of the modern. It’s appropriately melancholy but my response is the same: I like it without trusting it. Older music feels like a more settled pleasure – whatever arguments and ironies once animated it have evaporated. Bringing them back is a critic’s job, but not so much a listener’s. Mark Sinker’s writing on jazz in Freaky Trigger has been a fantastic introduction to what was at stake in the music, but I can still listen to something like Art Taylor’s A.T.’s Delight without catching any of that. It just sounds like a group of players having a really good time. Possibly that’s all it was – as a drummer, Taylor played with a lot of bandleaders, so I’m sure he could assemble a bunch of people happy to return the favour, and put aside the internal politics of the music as a thankyou for his nomadic reliability. Whatever the case, there’s a relaxed joy to the album which borders on goofiness and makes it a very attractive listen. And yes, there are drum solos, which is what I signed up for. For something like The B-52s – a record I’m surprised I haven’t listened to before – there’s a feeling of a band instantly carving and owning a niche, a bit of pop territory it can explore without encouraging imitation. Of course that’s appealing, and this is a glorious record, the bits I knew doors onto the parts I didn’t. On second listen what I caught were the ways the group do sound like their peers – take away Fred Schneider’s bug-eyed, lip-curled delivery and in places their disciplined noise reminds me of the Gang of 4. Finally, a potent curio: Adrian Sherwood’s one LP as his football-themed alter ego, Barmy Army. The English Disease is from 1989, and mixes found commentary and chants into Sherwood’s typically mechanical take on dub. As is the case with other albums which mix rhythm and found sound, the magic is in how the stiffer machine rhythms co-exist with the looser, unplanned patterns of speech, and in this case, the rough choral blizzard of voices in a football crowd. My Life On The Terrace Of Ghosts, if you like. Not my life, of course. But there’s such a powerful sense of place and time here that even I can pick it up. The English Disease was released between the Hillsborough Disaster and the 1990 World Cup, a season of tension and change in English football and society which the LP addresses head on – here’s then-beleaguered England manager Bobby Robson; there’s the voices of the Kop, of Wimbledon fans, of politicians, of the older school of sports commentator whose style was less banter, more orator. How it might have sounded in 1989 – stirring? corny? – I can’t know. The formal argument it makes – that a collage of samples and beats can capture the truth of a moment – has fallen out of fashion. The specific arguments it makes or hints at are long since won or lost. But for an hour it captured me. You say the Adrian Sherwood “social history through samples and beats” approach has fallen out of fashion, which may well be true. But this is a very direct descendent, isn’t it?